Published: March 13, 2017 at 03:54 p.m. Updated: March 14, 2017 at 04:20 p.m.
One of the premier pass rushers of the past decade is calling it a career. 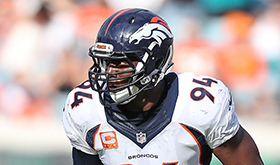 Free agent DeMarcus Ware announced Monday that he is retiring from football at age 34. "After a lot of thought and prayer, I've decided to accept the unknown and retire from my NFL career," Ware wrote on Twitter. "Tempting opportunities still present themselves for me to play and I feel better than I have in years. However, long term health and quality of life outweigh the spark and passion to play that I once had. "With that, I take this opportunity to thank all of the people in my life who had a hand in molding me into a great player and the God fearing man I am today. I thank the Dallas Cowboys and Denver Broncos for opportunities to experience what greatness feels like." Take a look back at the career of linebacker DeMarcus Ware. Ware finishes his 12-year career with 138.5 sacks, the eighth-most in NFL history. Every retired player in the top 10 has been inducted into the Pro Football Hall of Fame. Ware should join their ranks once he's eligible for the vote in five years. Among all players with a minimum of 100 games played, Ware's 0.78 sacks per game rank third behind only Reggie White's 0.85 and Lawrence Taylor's 0.79. Drafted No. 11 overall out of tiny Troy University in 2005, Ware quickly established himself as a terror off the edge in Dallas' defense. A nine-time Pro Bowl selection and four-time first-team All-Pro, Ware often drew comparisons to Taylor for his high-end athleticism, explosive first step and relentless motor. Few pass rushers have ever generated a seven-year stretch to match the prime of Ware's career in which he averaged 14.7 sacks -- and twice led the league -- from 2006 through 2012. Although Ware's effectiveness waned due to injuries in Denver the past three years, he can rest assured that the Broncos wouldn't have captured the Lombardi Trophy in Super Bowl 50 without his leadership and production. Ware was a terror in the 2015 postseason, racking up 3.5 sacks, eight quarterback hits and 11 hurries in three games. Ware was not just one of the best players of his era, but also one of the most respected by teammates, coaches and opponents. "I received a text message from Aqib Talib saying: 'Surprising decision. He still has a lot left in the tank. I believe that 100 percent. It was an honor to get to know him, an honor to play with him,'" NFL Network's James Palmer relayed. "I also got this from Emmanuel Sanders: 'Great player, but an even better person. He was the Peyton Manning of our defense. He carried himself with such class yet played with such tenacity.'" "DeMarcus was everything we could have ever wanted in a player, a person and a representative of the Cowboys organization. He was one of the most dominant NFL players at his position in his era, and he was one of the most dynamic players in the history of the Dallas Cowboys. We wish nothing but the best for DeMarcus and his family, and we appreciate and respect his contributions to the NFL and to our team."